On Tuesday, May 15, Speakers’ Lab and the Forward will present a moderated town hall event called “Now What? The Future of New Jewish Culture” hosted by 14th Street Y. “Now What?” brings together ten experts from across the country, including Stephen Hazan Arnoff of LABA and the 14th Street Y and Jody Rosen, from Slate, (see yesterday’s blog) to take a critical look at the last ten years of flourishing Jewish creativity in America and its precarious position today. Join us for the conversation. The event is free and open to the public. To register and for more information, including pre-event panelists’ statements, visit http://www.speakerslab.org/. In preparation for the event, six emerging Jewish artists were interviewed about their work, and what they think is the future of new Jewish culture in America. One of those artists, is LABA fellow Tirtzah Bassel. Can you tell us a bit about what you’re working on now? What was the inspiration for the project? I am working on a series of paintings titled TSA that explores the airport as a contemporary space of transit and transition. I’m focusing specifically on moments of physical intimacy that occur during security pat downs, or the way people hold their body when they are waiting in line. A couple of years ago I was randomly selected for what turned out to be a particularly invasive body search at the airport in Beijing. I was struck by the gap between the intimate nature of the physical touch, and its utter banality within that context. I also realized that this moment of contact contains within it an entire constellation of relationship to power and space, that it is simultaneously formed by it as well as continuously shaping it. It induced a whole series of questions: Who occupies this space? Who can move within it? When does a movement become a provocation, an act of discrimination, a sign of communication, a form of resistance? These questions form the basis of this body of work. In the next stage I am taking it one step further and designing the TSA Chapel, an intimate meditative space. The chapel juxtaposes the secular images of the airport with the structure of a sacred space, thus providing a place to view the paintings that is both critical and contemplative. Can you tell us about your Jewish-inspired work? I’m thinking specifically of your work with LABA where the starting point is Jewish text. The theme for our study group at LABA this year has been Blueprint. In each session we explore different types of spaces such as mythological, domestic and wild spaces through the lens of Jewish texts. What was striking to me is how these spaces seem to simultaneously reflect particular places in our personal and cultural psyche w­hile at the same time they also shape our vision of the world. In many ways, an attic in the Bible is just like an attic today, Reb Chanina Ben Dossa’s kitchen feels a lot like my kitchen. But at times the location of these spaces in our psyche seems to change with the culture or time. For example fields, the wild space of the Bible, have been replaced in the American psyche by forests. I thought about the ritual spaces of past, the places where people went seeking transition, transformation and a connection with something bigger than themselves. It struck me that airports play this role in our contemporary psyche. My starting point is quite literal. Airports are points of transportation that connect us to other places, they are where we go when we want to get from here to there. When I walk through the airport I think about the time in the location that I am in, but am aware of the time in my destination. I look at the travelers and wonder where each one of them will be in five or ten hours. There is the weight of too much luggage, the pressure of the security check, the frustration of waiting in line, of waiting in general, the uplifting feeling when the plane takes off. The paintings evoke these familiar images and cast them in the role of mythology, a symbolic investigation of our relationships to place, time and other people. You’re originally from Israel. Do you notice a difference between the Jewish-themed visual art coming out of Israel and the Jewish-themed art coming out of America? Is there a big difference in the themes or way they approach the subject matter? I see a significant difference between the way Israeli Jews and American Jews relate to Judaism in their work. I think most Israeli artists make a conscious effort to stay away from overtly Jewish themes, and those who do, often approach it through filters of cynicism or dark humor. I am thinking of the work of Roee Rosen or the earlier works of Zoya Cherkassy. One reason for the use of these defenses is that in the past Jewish art was associated with kitsch or was not considered serious art, prompting Israeli artists to avoid at all costs having their work labeled ‘Jewish art’. A deeper reason is rooted in the unresolved relationship that Israelis have with Judaism in general, due to the historic break that Zionism had with tradition and its attempt to replace Jewish forms with Israeli ones. In addition, the lack of first hand access of many secular Israeli artists to traditional sources prevents them from perceiving them as potent material for their work. In contrast, artists working in America today are part of a cultural climate that actively celebrates ethnic and cultural roots. One of the biggest challenges that artists face here is getting lost in homogenous oblivion, and many turn to their ethnic roots in the process of establishing a unique voice. The rise in popularity of Klezmer music in the United States over the past decade is a good example of this. Young musicians, both Jewish and not, have returned to this traditional form and through a process of revitalizing it have developed new and exciting materials. In the visual arts I see a strong trend to reexamine Jewish themes and symbols, including ritual objects, from a point of view that is both proud and inquisitive. Deborah Kass, Toby Kahn and Tobaron Waxman, each in their own way, bring Judaism to the forefront of a critical artistic discourse that speaks both to the contemporary art world and the Jewish community. Do you feel there is enough financial support for emerging Jewish artists in America? I believe there is a real need to build more support for emerging Jewish artists in America who aren’t making ‘Jewish art’ per se, but are engaged in a robust artistic practice that is informed by their Judaism in a more open sense. In civilizations throughout the ages, artists have been a creative, critical and revitalizing force, impacting all layers of a culture over time. Structured societies tend to fear the full force of creative freedom, but only through this freedom can artists truly use their medium to engage critically with the symbols of their culture and to offer new ways of engaging with them. Jewish artists working in America today are situated at the meeting point between Jewish culture and the contemporary art world. Inevitably these worlds inform and confront each other in profound and unexpected ways through artistic practices. Beyond the belief in individual artists, support for artists at this critical point in their careers testifies to a belief in what Judaism can offer to artistic discourse, and in what art can offer to Judaism. The 14th Street Y is proud to be the home of innovative Art and Culture through LABA, The National Laboratory for New Jewish Culture. On May 15th, the Y will be hosting a town hall-style event called “Now What? The Future of New Jewish Culture”. We’re re posting this from THE FORWARD, which is posting interviews in preparation for this event. Enjoy! On May 15, Speakers’ Lab and the Forward will present a moderated town hall-style event called “Now What? The Future of New Jewish Culture” at the 14th Street Y in downtown New York City. In preparation for the event, each panelist was asked to respond to a question related to his or her work. The Forward will publish one panelist’s response every Tuesday leading up to the event, and a second panelist’s response will be published on Speakers’ Lab’s website that same day. This week Jody Rosen, music critic for Slate, writes about how and why New Jewish Culture began 10 years ago. On Speakers’ Lab, Ari Roth, Artistic Director of Theater J, writes about how non-Jewish playwrights are addressing Jewish themes today. Speakers’ Lab: We’re wondering if you can help contextualize New Jewish Culture as an American Jewish phenomenon. What happened 10 years ago that spurred this groundswell of production? And second, is this culture, as it claims, genuinely new? What is it saying about being Jewish in the late 20th or early 21st century? Jody Rosen: What you call “New Jewish Culture” is actually pretty old. The impulses behind it, the desires driving it, the historical forces compelling it — these aren’t new at all. New Jewish Culture is merely another chapter in a saga that stretches back more than a century. Every generation of American Jews has reframed Jewish identity, and recast the Jewish historical narrative, according to its needs and whimsies. Turn-of-the-century immigrants shook off their patrimony to remake themselves as Jewish-Americans. The next generation fled to suburbs and created a new kind of aggressively assimilated Jewish life. The children of the Jewish suburbs, longing for lost authenticity, were convulsed by nostalgia for, of all things, the piety and deprivations of the Old World, from Lower East Side to Pale of Settlement. These are the Jews who embraced the shtetl-romanticism of “Life is With People” and “Fiddler on the Roof.” I’m wildly oversimplifying a complicated story, of course, but I think the broad outline holds. New Jewish Culture is the latest twist in the story. Over the past decade or so, young (and not so young) Jews have sought novel ways of talking about the Jewish past and present, created innovative forms of Jewish ritual and religious life, pursued different kinds of Jewish cultural expression. At its shallowest, New Jewish Culture becomes a kind of kitsch-chic pop culture party game: check out my dorky bar mitzvah photo album and my bubbe’s kreplach recipe! At its best, it excavates the past in order to animate the present and future. I’m especially excited by efforts — of everyone from tenured professors to organizations like Reboot — to recover Jewish stories that have been suppressed or ignored. This less defensive approach to Jewish history, replacing the old apologist-heroic Jewish narratives with something more warts-and-all, makes me more excited and proud to be Jewish, not less. New Jewish Culture may be in part a reaction to the identity politics of the 1980s and ‘90s, to the increasing tribalism of American life generally. I think it’s also a response to a Jewish-American culture that has staked too much on Jewish experience elsewhere — that’s been dominated by the Holocaust and Israel. The new Jewish-American culture puts the accent on American; it’s anti-Anatevka, and to a degree, anti-Jerusalem. Historically speaking, Jews have never been safer, more affluent, more powerful, more self-determining than they have in the United States. Maybe the land flowing with milk and honey is the Upper West Side, Park Slope, Cedarhurst, Brookline, Fairfax Avenue, Shaker Heights? On this ECO MONDAY post Earth Day, we’re reflecting on the work we’ve done over the last 3 years to become a greener, more sustainable building. Today we’re sharing with you our greening timeline, which we hope will grow more and more as we find ways to be a more sustainable contribution to our neighborhood and community. The theater begins its wood recycling program using the wood from the dismantled stage to build a storage unit, provide wood to renters for the creation of their set pieces, and donates the rest of the wood to “Broadway Goes Green”, an initiative that uses donated wood from shows to create wood chips for city playgrounds. The Y collaborates on our OPEN green HOUSE with organizations like Solar One, GrowNYC, and local, sustainable businesses. -We begin composting in our building through IESI. -We produce our “That’s Why I Go Green” song with a lyrics contest for kids. Let us know if you have ideas for a greener Y! Welcome 14th and 1st readers! As you may know, on Thursdays we like to celebrate all things theater, arts and culture. Today we’re posting an interview with Melanie Moyer-Williams, the Artistic Director of Red Fern Theatre company, who are producing the show MARCH in our 2nd floor 14th Street Y Theater. The Y: Thanks for speaking with us today! Tell us about your new show, MARCH? MMW- First – I just want to say how excited we are to be back at the 14th Street Y for our third and final production in our 2011-2012 Season! It has been such an amazing experience. Prior to coming to the Y last season, we had been in many theaters throughout NYC and have never really been satisfied with either the space or the people who run the space. Here at the 14th Street Y, we have found a wonderful home with both!! Everyone including the person who mops our floor each night (a very important job given we have a number of actors who go barefoot!) have been amazing with whom to work. And we look forward to many more productions here! 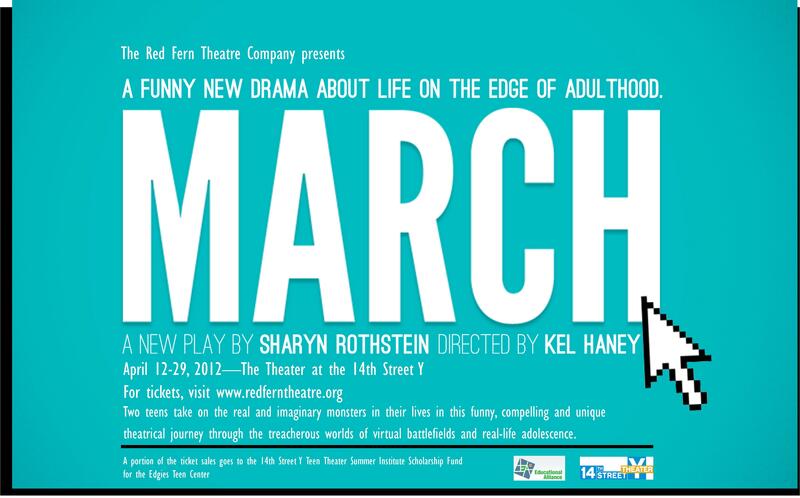 That being said – let’s talk about MARCH by Sharyn Rothstein, directed by Kel Haney. MARCH is a funny, new drama about life on the edge of adulthood. Two teens take on the real and imaginary monsters in their lives in this funny and compelling theatrical journey through the treacherous worlds of virtual battlefields and real-life adolescence. Though their backgrounds couldn’t be more different, Eva Lucia Perez, a 14 year-old from the Bronx, and Michael Meltzer, a 15 year-old kid growing up in the suburbs, are both dealing with complicated families when they meet as avatars in Eden, a fantasy realm in an online game. As they embark on a journey to a new level in the game, Eva Lucia and Michael become unexpected friends, and find in each other the escape they need to get to that place and time when you first realize that the world is bigger than your family. The Y: What audience will be most interested in this, do you think? MMW- I think Teens, their parents and their parent’s parents! This show has something for all of these generations, and we have had a wonderful response from each of these groups. Teens feel they relate to the two young characters in the play and especially have a connection in exploring the virtual world. Parents and grandparents connect with the many issues they face in just being a parent, but also in their own relationships with one another. One family deals with the issue of divorce while another one deals with mental illness in the family. We can learn a lot from each of these families in which the teens search to find acceptance and love and a place where they can escape everyday life. Both of the teens have been asked to act like a parent or an adult in the family. We see this happening more and more in society where kids are asked to “grow up” much faster. These two kids are able to escape reality and reinvent themselves in a virtual world. The Y: Interesting! So how do you create this visual world on the stage? MMW- We actually received a grant especially for the technology in this production. The Edith Lutyens and Norman Bel Geddes Design Enhancement Fund, a program of the Alliance of Resident Theatres/New York (A.R.T./New York), made it possible for us to bring this virtual world together. Using three projectors and projection screens – we bring to life the virtual world of Eden and it looks like something right out of a video game. It is really amazing to see the actors interact within this world. It’s unlike anything we have done before and very different from other productions I have seen. The show is worth the ticket price just to see this world. The Y: We really like working with Red Fern Theatre for a lot of reasons, especially your mission. Can you speak a bit about that? MMW- We founded the company to produce issue based or socially conscious plays, but we take it one step further and bridge the gap between the issues we present our audience and the change we seek to create. Instead of just exposing our audience to an issue facing our community, we also introduce them to someone who is trying to make a difference in that area. For MARCH, our partnership hits home – The 14th Street Y Teen Theater Summer Institute Scholarship Fund for the Edgies Teen Center. This summer the 14th Street Y will be offering their first TEEN THEATER SUMMER INSTITUTE (for which we will teach one of the classes!) and one Edgie will be receiving a scholarship for attendance. We are really happy to be able to give back to this community and the community on the lower east side. The Y: We do really like that. Anything else we should know? MMW– Come see the show! You won’t be disappointed and will find at least one character with whom you connect. It’s funny, yet it deals with difficult issues facing many families today. The cast is truly amazing and the production teams has truly brought this world to life in such a vivid, real way. Also, To say thank you for welcoming us to the 14th Street Y – we’d like to offer the community here a $5 discount. When purchasing tickets on our website – www.redferntheatre.org enter the code 14StY at checkout to receive the discount. The Y: Well thanks! We’ll pass it along to our community! All the best for a great run of March. Strength with the BUFF BRIDE! THIS IS CHRISTEN, our BUFF BRIDE! Christen is getting married in the fall, and is working out at the 14th Street Y towards the healthiest and most fit wedding day ever. We’re posting her workouts (with personal trainer Jordan) so that you might benefit from everything she’s learning and doing. We’ve included instructive links to those we thought might need a little more explanation. 15-20 of each, holding final rep for 15-20 seconds. A&B performed as super-set, which is back to back with 30-60 seconds rest between. B. Medicine ball chest pass. 8-12 repetitions of each exercise. Alternating days; one day performed multiple sets the next as a circuit. Alternating days; assisted stretching and various static stretches. Christen’s next series will focus more on movement, balance and coordination. Stay tuned for the next workout! At the 14th Street Y, we are so much more than a gym! We believe in engaging the whole person, your head, heart, body and hands. In addition to our well known fitness center, group exercise classes and basketball gym, the Y has a theater, a gallery, an artist fellowship program (LABA), and culture programming for all ages. Sustainability is also an important value to us. You have heard about fracking, and you know that we live on an island, but did you know that there are waterways that flow east to west under NYC connecting the Hudson and the East River? Did you know that New York City is one of the most water vulnerable cities in the US? One of our LABA artists, Anita Glesta was inspired by water, our concern for it, and her study of the story of Noah to create ‘Watershed’, a beautiful and haunting public artwork. “Watershed”aims to build awareness and educate community members in and around New York City about water ecology, which is of the utmost importance for a city surrounded by water. The artwork will be projected on 14th Street and in the building. If this is meaningful for you, there is opportunity to support the Y and LABA as we work with Anita to raise awareness and educate the community about the importance of caring for our waterways. To learn more about LABA, The National Laboratory for New Jewish Culture and our LABA House of Study, visit the Y website.